Casa Uccello is "a museum masking as a house." 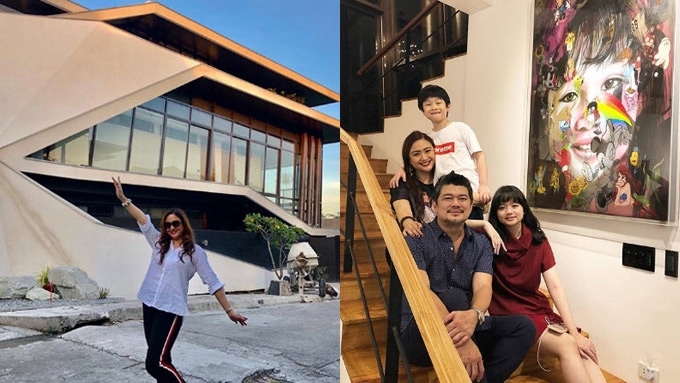 Julius Babao and Christine Bersola-Babao expanded their family home into a functional art gallery. The home of Julius and Christine Bersola-Babao is both an architectural feat and a work of art. Julius says, 'It's a museum masking as a home,'" Christine tells PEP.ph (Philippine Entertainment Portal) at the Globe myBusiness Star Bazaar event held in Megamall Event Center on August 17. Known to many on Instagram as #CasaUccello, which roughly translates to "Bird House" in Italian, the four-story home is actually an expansion of Julius and Christine's current family home. "Nandun din yung bahay namin nung bagong kasal kami. Binibili lang yung lupa sa tabi, dalawa," Christine continues. Casa Uccello is a personal passion project that Julius has worked on with various creative talents in the field. For the house's design, the ABS-CBN newscaster tapped the skills of Jason Buensalido of Buensalido Architects. Christine elaborates, "Uccello means bird, kasi bird signifies the Holy Spirit, di ba? The Father, the Son, and the Holy Spirit. "So, yung bird, siya yung Holy Spirit guiding us, kaming family. "At the same time, yung design ng bahay, is like a bird origami. "You take flight, di ba, you take on many adventures, so that you don't just stay in one place. "You keep on flying, and, at the same time, you are guided by the Holy Spirit." Casa Uccello is essentially an art museum. Christine reveals that part of the reason why they decided to expand their home is because of Julius's growing art collection. Their home currently houses over 360 paintings and art pieces which Julius has collected for over 22 years. When it comes to buying art, Christine puts her full trust in her husband. "I trust his sense of decision-making ever since, and lagi siyang tama. "When he invests in art, he always invests in the right art talaga..."
They own a number of prized art pieces, including this painting from Austrian-Irish visual artist Gottfried Helnwein. One of the house's main attractions, this painting is named "Pepper." Another eye-catching art piece, sculpted by artist Daniel dela Cruz, is an avian-inspired door handle that symbolizes the Babao family.